I write love. But love can be complicated, and I write that, too. 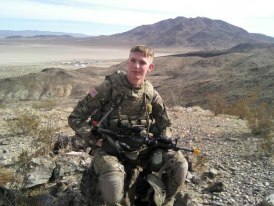 In late August, twenty-year-old Eric Clark, a close family friend was severely injured by an IED in Afghanistan (Note: pic of him in the linked article is not for faint of heart). My family met Eric when he was about ten years old where his father and I were both US Navy Sailors stationed in Hawaii. My kids have been close friends with Eric for nearly ten years. When I heard Eric was joining the Army and going overseas, I was worried but not overly so. I've known and worked with so many military who've gone to the Middle East and come back safe and sound. I've been over there several times, though not in a direct combat area, and came back safe and sound. His injury was a complete shock to me and brought home that anything can happen to anyone at anytime, whether here or there. Eric lost a leg below the knee and several fingers in addition to multiple other injuries. His honor and courage brought him to be there, doing the job most Americans don't want to risk, but his true heroism is in the way he's healing. It's in the aftermath. Eric is doing so much more than simply coping with his injuries. He's always had a crazy-funny sense of humor, and that humor hasn't left him. He's kept his spirits up, despite his challenges, despite his pain, despite everything. He looked forward to getting his first prosthetic (which happened Monday! ), and he wants to be running again by February. I know he can do it, too. If there's any way, he'll make it happen. No matter what he does with his career now, he will always be a soldier to me. He still has that fighting Army spirit, is still behind his division in the Middle East, cheering and motivating them to succeed and come back safely. That is heroic. That is strength of character. That is why I love Eric. He's now recovering in Bethesda, MD, where he'll stay through his physical therapy. Anyone who'd like to thank Eric for his service can send letters and care packages to the address at Bethesda listed on the linked article above. If you're particularly moved by his courage, please donate to the Wounded Warrior Project. I'd be happy to tell Eric he's inspired someone to help out such a huge supporter of wounded veterans. Or you can write and let him know yourself :) Send him a message on Facebook! What qualities make someone a hero to you? Who do you consider a hero and why? His attitude is what will see him through that experience. The person who does what is right despite the odds, despite fear, and despite what others think, is a hero to me. And growing up a military brat I admire anyone who serves our country. Wow. These guys are the true heroes. I have always wondered why people pour over People magazine and the movie industry dumps billions into actors and actresses yet we pay our soldiers and other law enforcement officers so little. It rather pisses me off, in fact. Maybe that's why I'm so into books instead of TV or movies. Thanks for sharing, Ang! I'm so sorry for your friend Angela... He is definitely a hero! US Navy Sailor and Romance Author. Repped by the fabulous Nalini Akolekar of Spencerhill. My debut paranormal romance is available on Amazon, B&N, iBookstore, and Kobo! It's here, It's Release Day!